The Kyocera CS 300i Black & White multifunctional system encompasses the ultra-reliability, unsurpassed performance and proven technology that you demand for your advanced document imaging needs, all in a sleek, space-saving design. 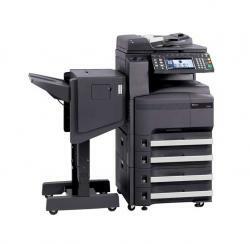 At a productive output speed of 30 pages per minute, the CS 300i delivers crisp black & white output, brilliant scans in both full color and black & white, and optional fax/network fax. Engineered with Copystar’s unique long-life technology and embedded HyPAS, Copystar’s powerful and scalable software solutions platform, the CS 300i provides you with maximum performance and seamless integration with widely accepted software applications for virtually any business environment. Exceptional document imaging for any office environment, that’s the Copystar CS 300i.